Since we are now officially halfway through the block making portion of the Rainbow Scrap Challenge, I thought that it was time to show off all 55 of my farmer's wife blocks that I have made thus far. I am SOOO HAPPY with this so far! I am excited that I get to make 56 more! I'm also happy with the great variety of colors, tones, and different fabrics. There isn't a single block that seems out of place now that all of the blocks are together. Hooray for finishes -- no matter how small! My Good Karma placemats are now finished. It took me slightly longer than one evening to do the binding, but I am thrilled with the results. As I mentioned in my previous post, these were scraps leftover from my Frame of Mind quilt, with the exception of the binding, which came from my Square Pegs quilt. For the binding, I machine bound each and for the stitching on the front, I used a decorative star stitch. It uses a lot of thread, but it is just so cute! I've used it before on the shelf runners I made for my baker's rack. Gratuitous corner shots because they turned out GREAT on all four placemants -- a true miracle! These shots also show the quilting off well if you didn't have a chance to look at it before. This is now the fifth time I've used this motif for a major FMQ project. It's a good one to have in the arsenal because it is easy to scale up and down and can be adapted as an all over filler or for your borders. Sharing at Free Motion Mavericks and Finish it up Friday! It's already Week 4 of May is for Makers! Time is flying! 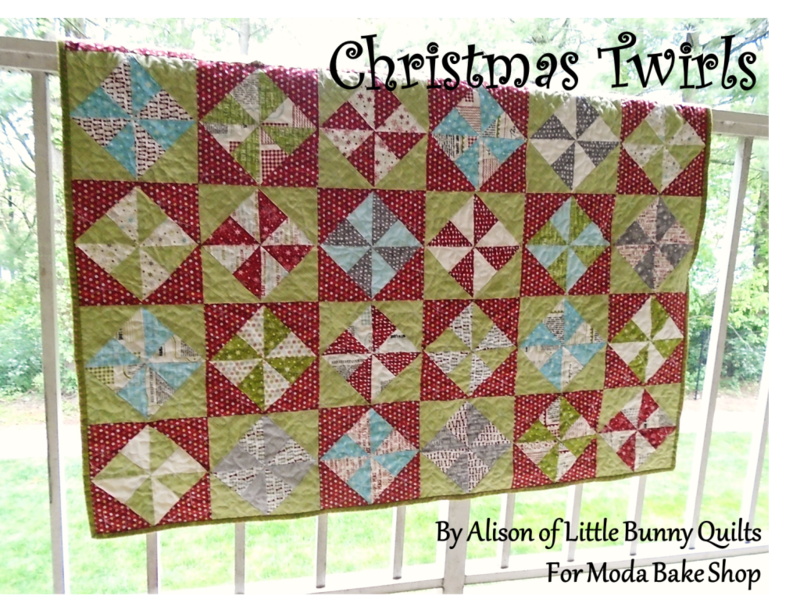 This week, a Christmas quilt caught my eye -- maybe because I've had Christmas quilts on the brain lately! I decided to purchase Peppermint Twist by Sharon Holland. This is another more advanced pattern but unlike some of my previous May is for Makers purchases I don't have anything in mind for this one quite yet. I definitely think this is super adorable and I'll be able to use my 60 degree ruler! Do you like to challenge yourself with your quilting? What inspires you to learn new techniques? Since I finished my Farmer's Wife blocks last week, I decided to dig in my abandoned project box to see if there was anything I could work on to keep making a dent in my green scraps. A long, long while back, I started working on scrappy birthstone blocks. At the time, only ended up making four blocks and then the project got shuffled into the box. This pattern is from No Hats in the House. I had to work in a few more prints into the peridot block, but I think it still turned out good and will blend well with the blocks once they are all done. Now I have six blocks done! I will still need to make a garnet for January, aquamarine for March, ruby for July, sapphire for September, opal for October, and blue topaz/tanzanite for December. That's three blue blocks, two red blocks and one white/rainbow block that will be worked in over the next few months. A while back, I started working on some place mats made from the scraps left over from my Frame of Mind quilt. 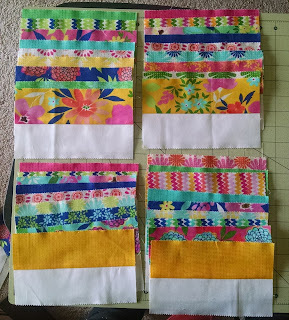 I had the ends of all of my strip pieced pairs, and was able to cut 7.5 inch sections from the "stubs." I ended up having to take some of the pairs apart to get my strips to alternate properly, but I had enough to make four place mats from my scraps. I had lots of my blue backing left over as well, so I layered them all up with batting scraps. 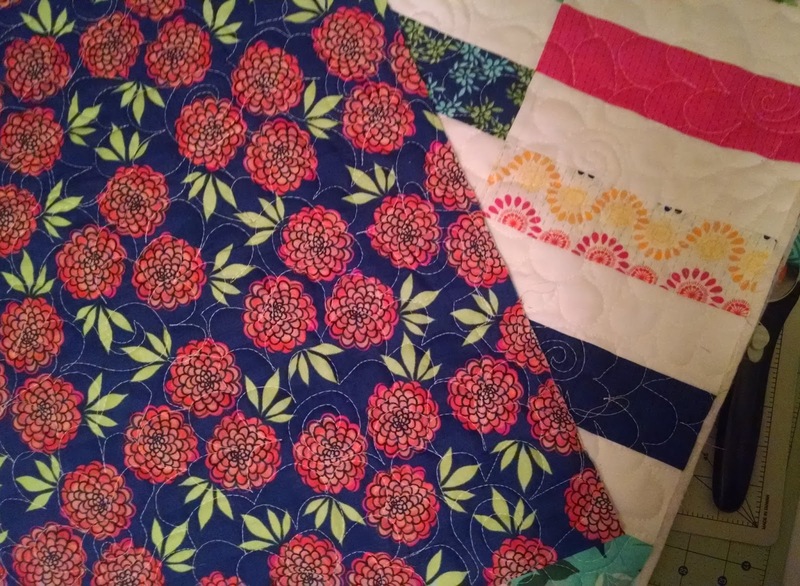 These sat on my quilt rack for a long time and I finally just sat down and got all of them quilted last night. I used the same swirly chrysanthemum quilting pattern as I did in my Frame of Mind quilt. I didn't have enough of the ziggy stripe to bind it with the same fabric, but I found the extra backing that I had from my Square Pegs quilt will work perfectly for binding these -- and I won't have to piece them at all! Hooray! I'm hoping to finish these tonight and it shouldn't take long since they are all trimmed and ready to go! It's week 3 of May is for Makers! After my first two weeks where I picked patterns where I had fabric bundles/precuts in my stash that work well with each, I decided this week to pick something that could potentially work with scraps or a more random assortment of fabrics from my stash. This pattern by Little Louise Designs caught my eye for lots of reasons -- one of them being that it is fun and bright. It's been rainy and dreary here in Maryland for what seems like weeks (although the sun is peaking out right now!) and I've been itching for some sunshine in my life. I am strongly leaning towards this being a scrappy quilt (and potentially a scrappy baby quilt, because I always have to be prepared!) but also think this could be AMAZING adapted into some sort of a rainbow quilt! So share with me: Are you a fabric before the pattern, or a pattern before the fabric kind of shopper? Or does it really depend? For me, it really depends, but more often than not I buy fabric before I know what I am going to specifically do with it. Christmas Twirls at Moda Bake Shop! I'm excited to share my THIRD Moda Bake Shop quilt pattern today! Introducing Christmas Twirls! 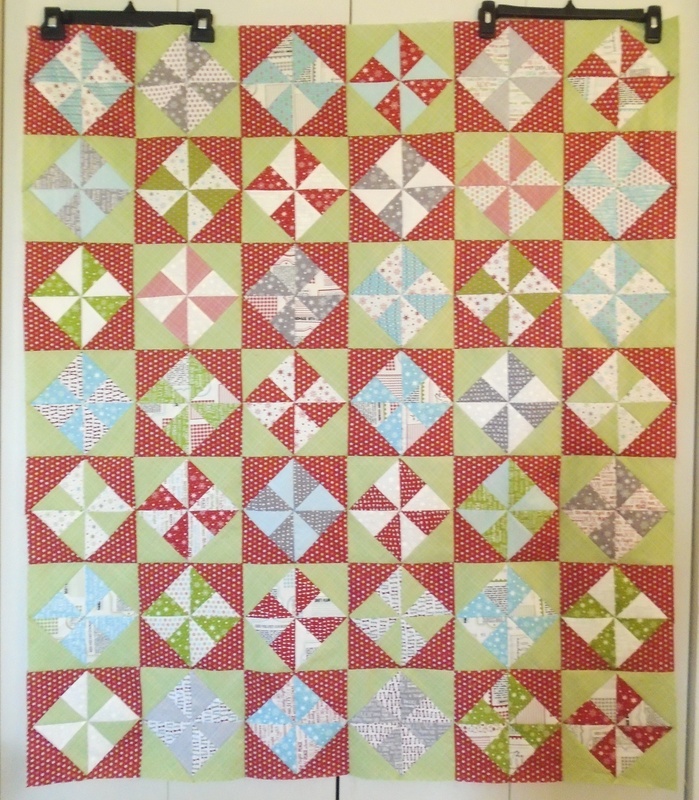 This quilt is made from two charm packs of The Cookie Exchange by Sweetwater, as well as some red and green yardage. Each block is a pinwheel set inside four triangles. Each pinwheel is made from one pair of charm squares. Here's a picture of my quilt top before it was quilted. 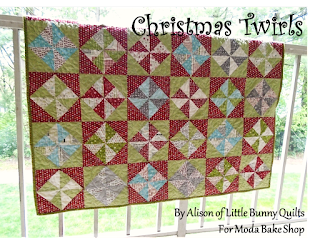 This quilt finishes at 42" x 49" and is a perfect Christmas quilt to snuggle with! Click here to go to Moda Bake Shop to see the tutorial! Don't forget to share your version of this quilt with me! Sharing at Finish it up Friday, Sew Cute Tuesday! Today I am sharing a fun block tutorial over at Benartex's blog Sew in Love with Fabric as a part of their Bali Batiks blog hop! I call my block Aruban Puzzle as it is a fun twist on the classic Dutchman's Puzzle block! Click on over to see the tutorial, but before you do, leave a comment to enter my giveaway for your own set of Bali Batik fat quarters! Click here to see the entire Rio collection. To enter, tell me about your summer quilting plans -- are you going to be starting any new projects or will you be tackling your WIP pile? I'll be trying to finish up some WIPs but I also have some new projects planned as well -- including some of the patterns I have bought as part of May is for Makers! 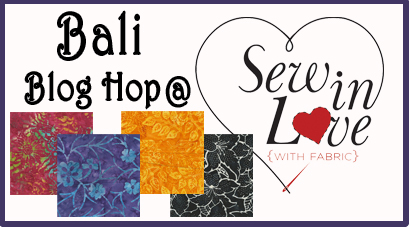 If you're coming from Sew in Love with Fabric, thanks for visiting! I hope that you stay a while and see what I've been up to lately! The giveaway is now closed! Our winner is Janet! A pile of greens BIGGER than what I had in my scrap box was hanging out in a bag of fabrics that I had brought home from my mom's house at least a year ago. Some of these are really large hunks and chunks from backings. Needless to say any dent that I make in my greens will be outweighed by this discovery. Oops. I decided to go ahead and finish up all of my green blocks for this month and then start thinking if there are any other projects that I can do with primarily greens (time to dig through the abandoned project box!) over the rest of the month. Since Hovering Birds and Hovering Hawks are such similar blocks, I did my best to color them very differently to keep them from looking too similar. I think my favorite out of this set is Honey's Choice. 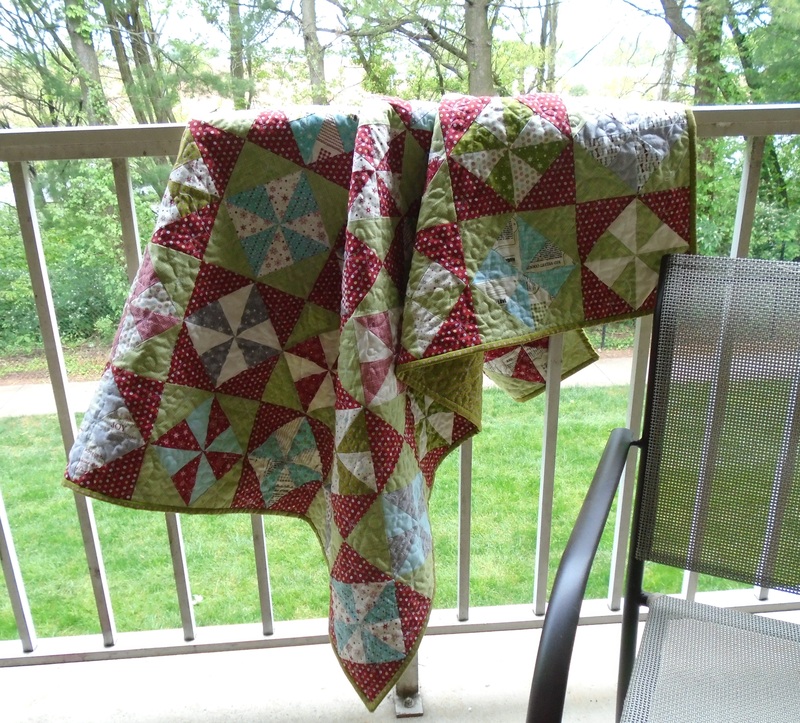 Despite the wide range of greens, I think these will blend well together once I finally get all of these blocks completed and finish the quilt. I've already started thinking about how I am going to put this quilt together and what colors to potentially use for sashings. My initial thought is to use white or off white solid since I haven't used any solid other than a little bit of grey solid last month. My other thought was to put a thin border around each block in a solid color -- for these green blocks I would use various solid greens -- and then put all of the blocks together. How do you think I should put everything together? Any FW veterans out there with tips to share? Sharing at Scrap Happy Saturday and Fabric Tuesday! It's week 2 of May is for Makers! This week I decided to pick something that has been on my Pinterest Quilt Inspiration board for what seems like forever. May is for Makers is a great way to shorten those wishlists! 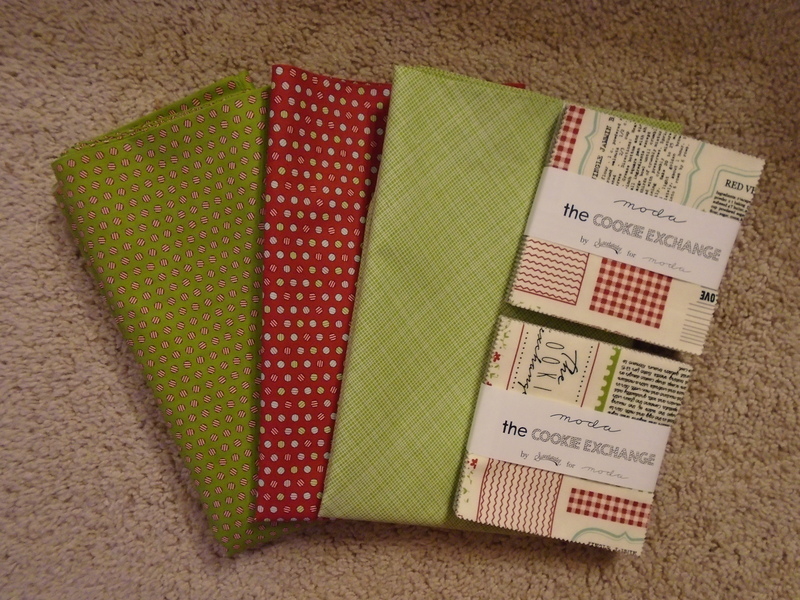 I have a fat quarter bundle of the fabric as well as some additional yardage of the black floral print. It's not quite enough fabric for the throw size version, but I have lots of fabrics that I can pull from my stash to mix in. What have you bought this month to support makers? 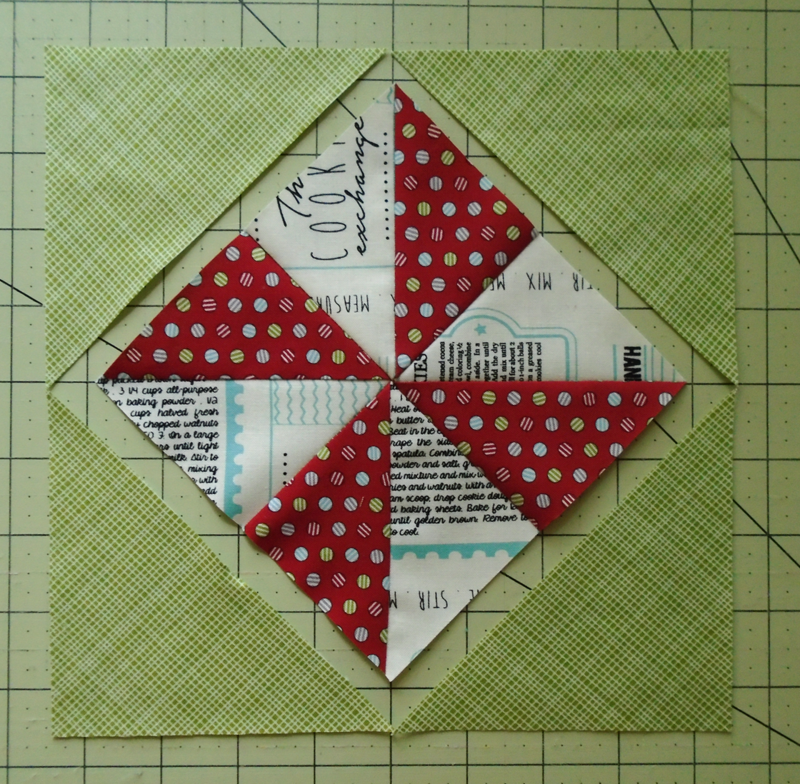 It's a new month and that means a new color for the Rainbow Scrap Challenge. This month our color is green with brown accents. To me this doesn't seem like quite as much green as I thought that I had but hopefully I can get through a lot of these scraps. 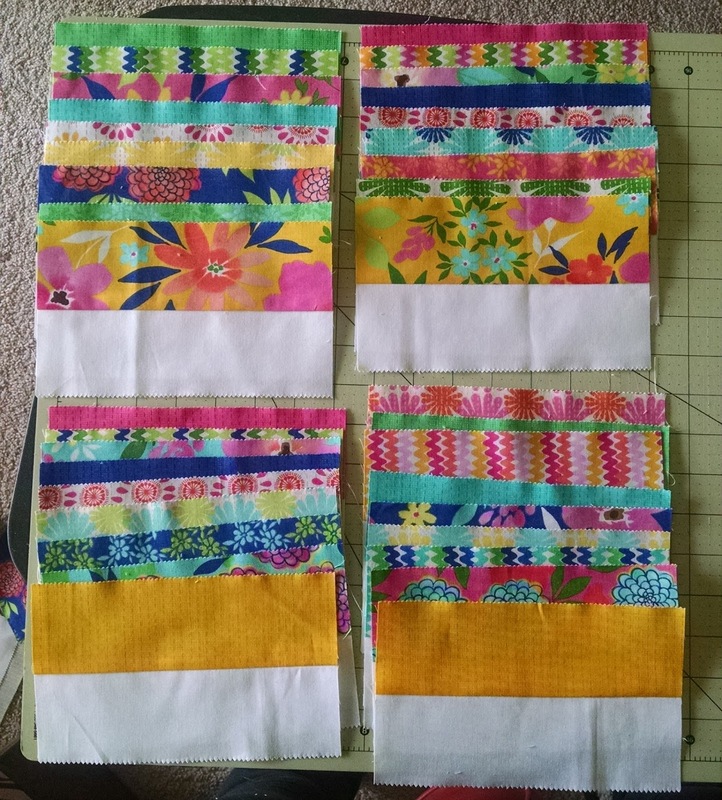 The Homemaker block had lots and lots of y-seams, despite being paper pieced. It did come together well, but it took a double dose of patience this week. The rest of the blocks were relatively simple -- I did eliminate some unnecessary piecing in both the Homeward bound and in the Honeycomb block. What are your scrappy projects this weekend? Or are you starting something new? Sharing at Scrap Happy Saturday, Linky Tuesday, Sew Cute Tuesday, and Fabric Tuesday! 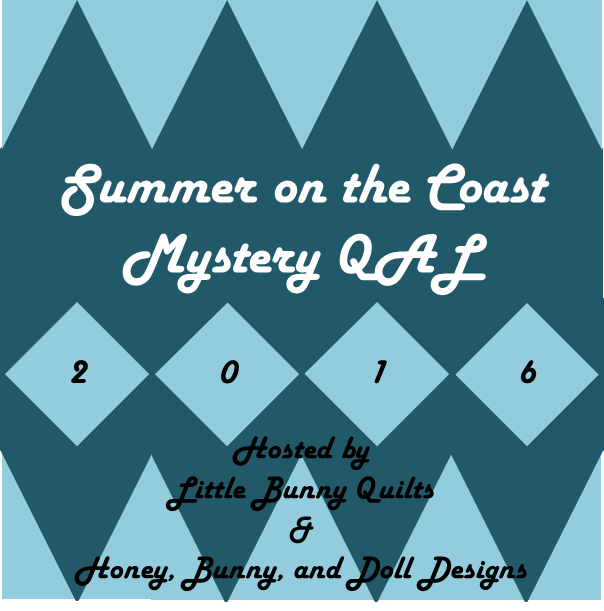 Welcome to our second month of the Summer on the Coast QAL! This month we are making slightly more complicated blocks -- triangle in a square blocks! Center triangles: cut 7 inch wide strips across your WOF. See below on how to cut your first angle -- you should be able to get 10 triangles per WOF. Side triangles: cut 7.5 inch by 4.5 inch rectangles -- you will need to cut half of your rectangles from upper right to lower left and cut the other half of your rectangles from upper left to lower right. You will need one of each type of small triangle (left handed, right handed) for each unit. Note: pre-cutting is NOT necessary if you feel confident in your paper piecing skills! 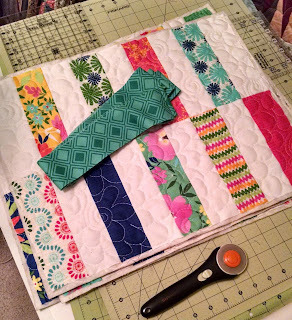 To start, fold your triangle-square units along one of the triangle lines.use that fold to trim the same angle across your 7 inch fabric strip. I cut my strip 1/4 inch away from the edge of the paper. This will make it easier to line up your small triangles. As noted above, you will need to cut both "left handed" and "right handed" half-rectangle triangles. If you layer two rectangles wrong sides together and cut diagonally once, you will have both two sets of triangles. If desired, pin your fabric strip to the foundation. Line up your first triangle to the pre-cut edge and sew on the line. Press your triangle away from the background strip. Fold along the opposite triangle line and cut off the excess background fabric strip - don't forget to leave a 1/4 beyond the fold for your seam allowance! Place your second small triangle along the second angled edge and sew on the foundation line. Press your block. Make sure that your triangles cover the entirety of the block as indicated by the dashed lines around the block. You may need to increase the size of your half-rectangle triangles if you have trouble with lining up the triangles correctly. When you've made sure that your pieces are lined up, you can trim your block along the dotted lines for a 6.5 inch block (6 inch finished). Sharing at Fabric Tuesday, Sew Cute Tuesday, and Let's Bee Social! If you haven't seen others post about it, Lindsey at LR Stitched is hosting/promoting May is for Makers. Each week, we are going to buy a pattern from someone -- 5 weeks in May, 5 patterns from 5 designers that get a little boost of support! Each Monday, I am going to share the pattern that I bought. I will chose each pattern on my own, none of these will be sponsored posts from the designers and I am going to make a concerted effort to pick a pattern from someone that I am not already "quiltfriends" with. 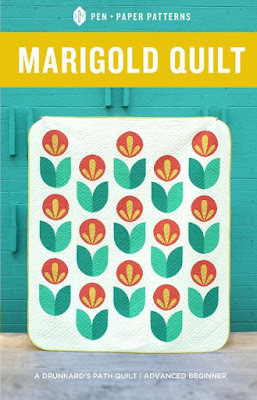 This week, I bought the Marigold Quilt Pattern from Pen + Paper Patterns. To be perfectly honest, for the last year or so, I have felt relatively unchallenged in my quilt projects. I haven't worked with curves in any serious fashion since I finished my New York Beauty Quilt three years ago. So part of my choices for May is for Makers will be focused on challenging myself with some more difficult quilt patterns. I think this quilt is just adorable (obviously!) and I definitely see this pattern as a little out of the box for me. I am thinking that I will make this quilt from some of my Bungalow stash. Another cool thing about this pattern is that you can buy all of the necessary templates (if you don't want to make them yourself) from this Etsy Shop. 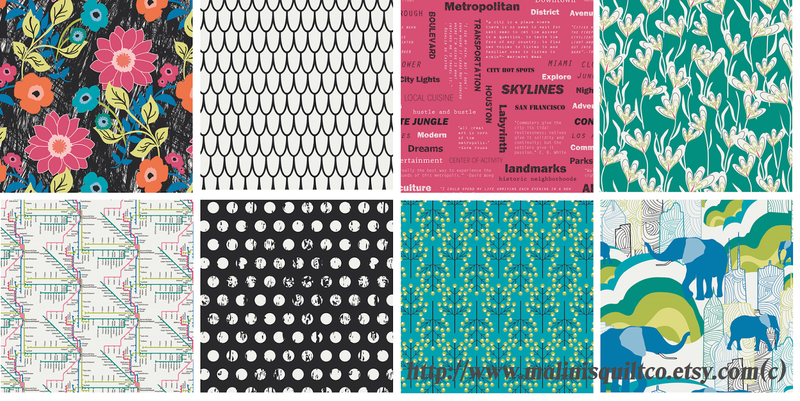 I am not sure if I would buy templates just for one pattern, but I like that it is available as an option. Are you joining #mayisformakers? What do you look for when pattern shopping? 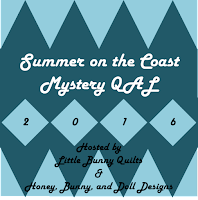 Don't forget to come back tomorrow for Month #2 of the Summer on the Coast QAL!